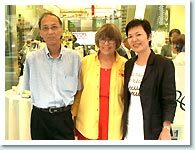 I, Kiyoshi Nonaka, met Mrs.Grossman at Itoya-san where Mrs.Grossman’s sticker fair is held. Mrs. Grossman, who is famous in Japan wanted to see me. She is a great fan of the Screwpunch, and was keen to meet its producer. 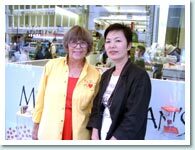 ※The usage of her picture on this web site is approved by Mrs.Grossman.